The mutual fund giant, Fidelity, has a brief summary of the different types of curves and what each says about investors’ expectations of future economic conditions. On the page is an interactive movie of the yield curve for the past 30+ years. For those of you who have devoted a lot of money to bond funds, you may have noticed the recent 10% drop in the value of any longer term bond funds you have. 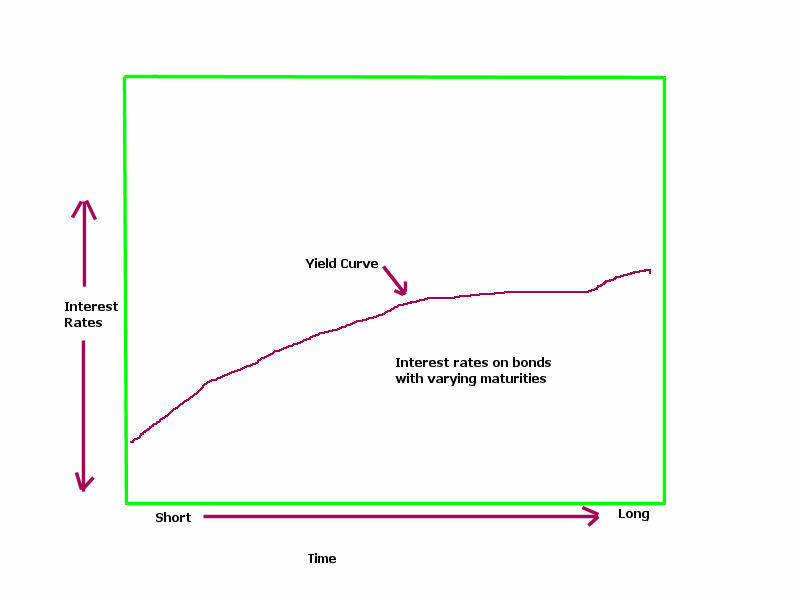 From October 2009 to April 2010, long term bonds stayed fairly stable in price. This summer, as doubts about the recovery emerged, prices for these long term bonds increased rather dramatically – about 16% – as investors became more risk averse and were willing to pay more for long term maturities. Investors were willing to accept lower yields or interest rates on their money. As interest rates on Treasuries dropped, so too did rates on 30 year fixed mortgages which neared 4% during the summer. The current downward slope in long term bond prices signals a returning confidence in the economy’s recovery. We have also seen an increase in 30 year mortage rates to near 5%. 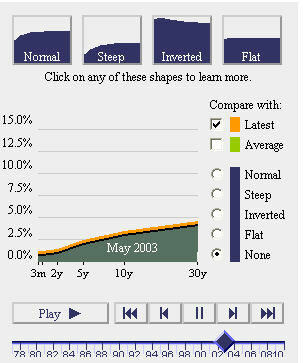 From the Fidelity page cited above, I compared the yield curve now with the curve in mid 2003. In October 2002, the stock market fell to its low point after the bursting of the internet bubble and the 2001 – 2002 recession. It see-sawed for several months until the spring of 2003 when it began a steady rise for a year. The orange line in the graph is today’s yield curve, almost exactly what it was 7-1/2 years ago, suggesting that investors have the same expectations for continuing growth in the economy now as what they did in 2003.